In the iconography of golf, arguably only Bobby Jones and Arnold Palmer loom as large as Old Tom Morris. No one made as great an impact in so many different phases of the game—player, club- and ball-maker, greenkeeper, course architect—as the bearded St. Andrean. It can be difficult to get a good view of Old Tom-as-architect because much of his prime was spent in a period of rapid technological transition, in golf and the world at large. When the guttie ball arrived on the scene in the late 1840s, Morris embraced the new and improved technology, leading to his famous schism with featherie traditionalist Allan Robertson. The guttie won out for a time, but by the last decade of Morris’s life (he died in 1908), the rubber-cored Haskell revolution was in full swing. This is important because the livelier ball greatly affected the way courses were played—and designed. The result is that some, though certainly not all, of Morris’s work was lost during an era in which Harry Colt, James Braid, and others brought his courses into the 20th century. Old Tom’s original commissions were more ad hoc than what we now expect: He’d lay out six holes here, 12 holes there; in later years, as the 18-hole round became standard, clubs would bring in a “closer” to extend their courses to something more like their contemporary form. Ultimately, it stands as a great compliment to Old Tom that so many of the places he visited in various capacities—developing the bones of a routing or laying out several holes—have evolved into some of the finest courses in Great Britain and Ireland today. He was truly golf’s foundational figure. Analyzing Old Tom’s work from this distance requires drawing inferences from fragmentary evidence. Earthmoving capabilities were next to nil in his day, so Morris let nature guide his hand. “Tom’s expertise,” says Andrew Lochhead, archivist at Prestwick, “was the way he adapted each course to suit the land at his disposal. If you’ve ever been to Prestwick, you will know how undulating the land is and how some of the most severe features were used by Tom to add to a hole’s difficulty in terms of the carry required or the best angle of approach for a drive or shot into a green.” Morris was also a master at selecting green sites—often situated on natural tables or well-draining sloughs—that maximized playing interest. While no one person “designed” the Old Course, Old Tom is nevertheless the father of the links we know and love. In the 1870s, he oversaw a host of improvements. Some, like the stabilization of the Swilcan Burn and the herculean efforts at gorse clearance that enabled today’s counter-clockwise routing to emerge, fell under the greenkeeper’s ambit, while others, such as the extension and connection of several double greens, are architectural in nature. Prestwick also makes a strong claim. This is in part influenced by its role as the birthplace of the Open and its strong associations with the Morrises as players—Old and Young Tom won eight of the first 12 championships, all at Prestwick. But Morris, who had moved his family west in 1851 to become the club’s Keeper of the Green, also designed the 12 holes over which those early epics unfolded, and much of that work still exists. The original Alps, seized upon by C.B. Macdonald as one of the classic hole types he would import to the National Golf Links and beyond, can be found here, while the siting of the 13th green (“Sea Headrig”) among wild, oceanic landforms is a work of enduring genius. Crail (Balcomie) beautifully captures the spirit of Morris’s era. There’s no standardization to “shot values” here. 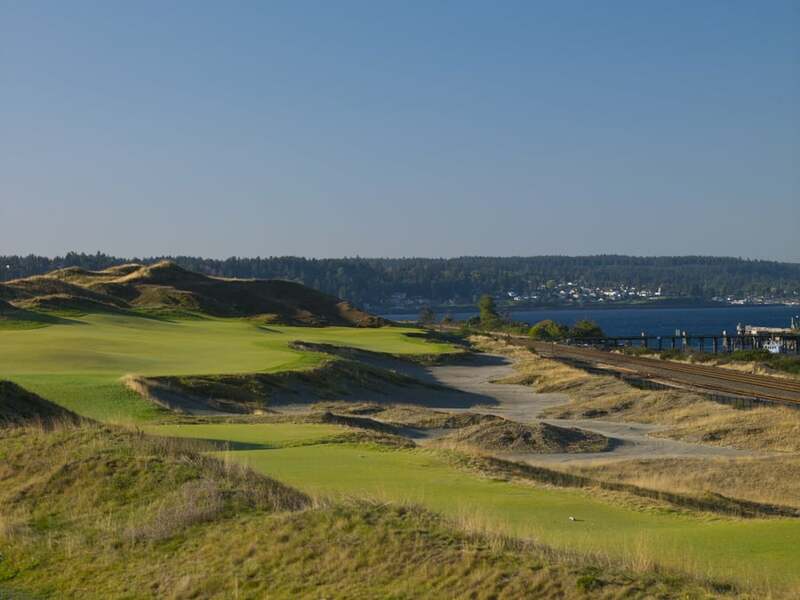 Old Tom’s interpretation of the lay of the land produced lively, quirky short holes as well as such monsters as the 447-yard Cape-like 5th and the par-three 13th, which measures 214 yards and plays both uphill and across a chasm. Luffness New is an Old Tom gem that’s hidden in plain sight, directly adjacent to Gullane Hill along the main road to North Berwick. Many members of nearby Muirfield—routed originally by Morris, though the course we know today is essentially the work of Harry Colt—play for years at Luffness before receiving an invitation to wear the red jacket. Luffness is notable for its subtle greens, which are kept in immaculate condition. In the Highlands, Tain Golf Club is another Morris that many travelers overlook on their way to Dornoch. It features a spectacular Alps hole (the 11th) with a green set at the edge of the Dornoch Firth. The first and the final greens at the Old Course, both Morris creations, are among the most instantly recognizable in golf. The former is fronted by the Swilcan Burn, the latter by the Valley of Sin. 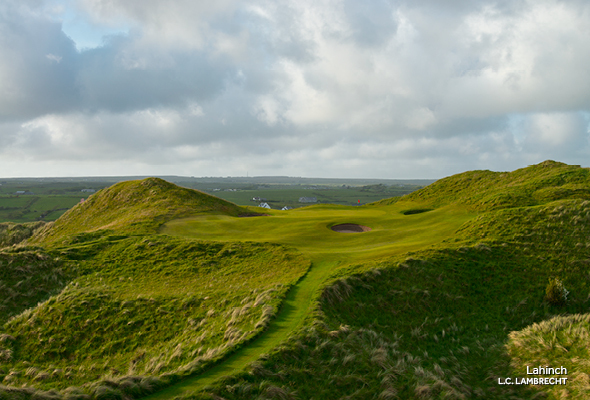 Ireland’s Lahinch also boasts one of Old Tom’s most notorious one-two punches in the Klondyke and Dell holes, both of which employ blindness in wildly entertaining fashion.